We are overjoyed to be selling a lovely library selection of vintage and antique children's nursery books, sourced from Paris. Contact us, or stop in to view the selection. We invite you to browse through the current brands that we stock at the little shop. We seek unique, child-friendly brands that are designed and made in Europe with great love, care and attention to detail. Exclusively found at Leuie. Made in Italy, Babe and Tess offers childrenswear from 3 months to 10 years. Wearable and soft, their collections are eco-friendly and quite thoughtfully designed—best worn and enjoyed daily, intermixing incredibly well with androgynous pieces. 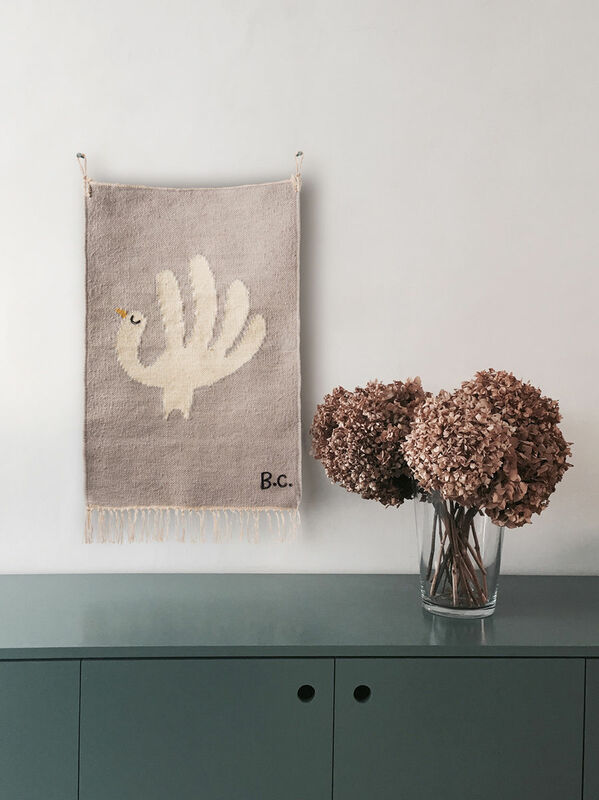 Very relaxed and lovely, Buho is a Barcelona-based brand that marries classic bohemian (Spanish) style with a refreshing modern touch. Heavily made of pure fabrics, such as linen and cotton, it's the very essentials that every little wardrobe needs. Ages 0—12. A wonderful brand for babies and children, ranging from 3 months to 12 years, entirely made in Italy. Beyond Dreamers' notable fashion, its infant sister company, Nina Luna, produces baby accessories—from booties to change pads, all with their signature cotton, and specialty Italian fabrics. Made of primarily soft cotton, this iconic Parisian brand is full of cuteness and charm. From the cozy comfort wear to chic rompers for babies, softness and ease ranges supreme and creates a feeling of childhood sweetness in the wardrobe. Designed for babies and children. Just as its namesake suggests, this brand is the essence of beautiful French quality and is simply put, incredibly "yummy". With fabrics, unsurpassed for quality, and sweet, sweet details, this brand is a must for everyday beauty of living, for baby up to 6 years. Inspired by quality materials, and made with the finest attention to detail and design. Silhouettes are reinvented and colors and shapes are pieced together beautifully to create a collection that is truly outstanding, and unlike any other. Quality, soft materials, and a classic, relaxed Italian flair make this all-boys brand simply irresistible. Perfect for easy layers, their pieces create a classic look. Very stylish, and designed for little ones aged 0—10 years. Perfectly European in quality and style, Poppy Rose offers a sweet selection of styles created with stunning fabrics—and well known for their use of Liberty prints—and classic silhouettes, with a flair for fun, for boys and girls, ages 0—10 years. Built upon and understated palette, incredible unique designs and soft, soft fabrics—ranging from organic jerseys, and soft natural fabrics such as wool, linen, cotton, leather, and silk. Sure to be a must-have for the touch alone. Speckled in stars, Tocoto Vintage wonderfully marries classic, Spanish bohemian style with modern, relevant details. Their wide collection spans from soft baby suits to tote bags, stroller blankets and a signature fragrance. You are sure to fall in love. A mixture of art, whimsy and storytelling. De Beaux souvenirs uses wire as a medium to create beautiful handmade pieces for the home—from rose bud picture frames to fanciful birdcages. Each piece is unique and one of a kind. A fine children’s brand based on time-honored values. Litolff reinterprets classics with individuality and a contemporary design approach. The collection’s motifs and colors find their roots in a letter that Heta Litolff wrote her daughter in 1946. Beautiful, imaginative, original. Classically French, Nini La Duchesse is sure to enchant and add a touch of whimsy and delight to any space. Specializing in hanging musical linen mobiles, each piece is entirely handmade—making it both a treasure to give and receive. "Only for happy children", as they cheerfully say... this wonderful brand continues to delight with its array of linens and essentials for little ones—from hooded bath robes to perfectly cozy rompers. Their brand is entirely certified eco-friendly, and produced carefully. Famous for their open and airy, dreamy mobiles for babies and children alike, each and every piece is hand crafted (and often hand knit!). Little creatures, clouds and moons, each embodies little details and a quality of imagination. Adored by children and adults alike for their old world packaging, flourished with whimsical designs, yet wonderfully understated and authentic. Founded upon the belief in natural wooden toys and family roots, each is created with love and care—made to last, and to be loved for many, many years. A fanciful accessories collection based in London, England. Woodstock is famed for its incredibly sweet animal ear headbands and bows, playful wands and handsome bow ties. Made entirely by hand, each is a treasure, and something to keep for years to come.